In today’s ever-changing ultra-competitive commercial display systems market, there is an assumption by some that the differences between the quality of professional commercial grade displays and consumer grade displays does not warrant the higher cost or capabilities. Professional commercial displays typically come at a higher cost than a TV you could purchase at a local retailer. The typical knee jerk reaction is “I can go to the local retailer and purchase the same size TV for much less.” But in reality, there are key benefits for using the higher quality and more reliable displays that fit into the pro grade category. “It’s tough to find a consumer-grade panel that is rated for longer than 10 hours of use per day, roughly double the typical TV-watching habits of most consumers. In a quick service restaurant environment, for example, the displays are expected to operate continuously for 15 to 24 hours per day (as menu boards). Because they’re built using higher-end components, commercial-grade displays are able to run reliably in that timeframe. It’s one of the reasons they cost more, because the last thing an operator wants is for a display to go blank during a broadcast,” says Keith Yanke of professional grade display manufacturer NEC. 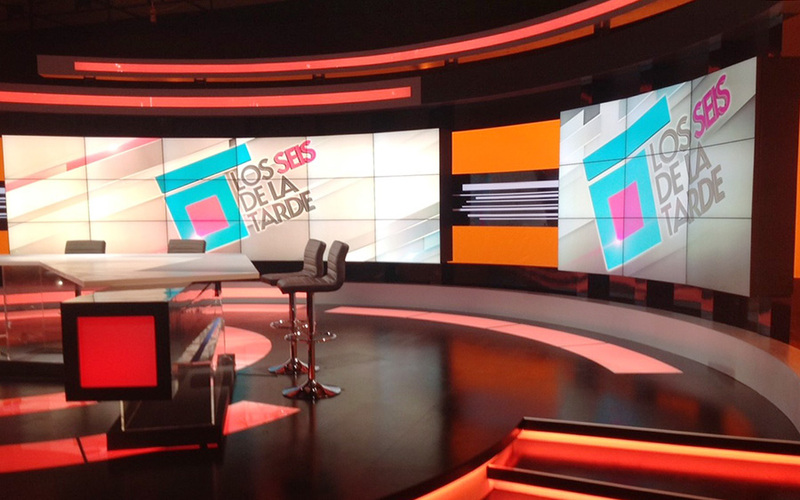 The allure of a potential capital cost savings is usually the justification when considering purchasing consumer displays in place of choosing professional commercial grade displays for any broadcast project. A better way to think of this, however, according to AV Design Services, is purchasing a consumer grade “TV” versus purchasing a commercial grade display with all of the benefits that are included with the purchase of a commercial grade display monitor. It’s important to remember the display systems you choose will be on your set for at least five years after the decision is made and typically longer than that. Occasionally you may find other trades attempting to advise you concerning set technology choices, including trades that specialize in other disciplines and lack the technical expertise and background necessary to advise clients properly when choosing the proper AV tech for your set. Selecting an inadequate display can be a costly mistake, especially when you consider many stations don’t update their sets more than once every five years or so. Another key point to remember with on-set displays is that high brightness is not needed for indoor broadcast applications. “It depends on the application. Because an application is indoors does mean there is controlled lighting continuously. Be it a QSR or retail location, sometimes high-bright units are needed because of the ambient light. The correct display at twice the brightness could prove invaluable, and be the difference in getting a brand message across and failing to do so, “ says Yanke. Higher brightness displays also provide users with application flexibility. If all the brightness is not needed, the user can select a lower brightness (500 nit units is standard for broadcast applications) that ultimately delivers lower power consumption and longer life. In some cases, too, higher-end commercial-grade displays provide intelligence to control brightness levels, automating them depending on the ambient lighting. A small studio with little lighting issues will find a 500 nit brightness unit is more than adequate. But outside of that scenario, there are a lot of variables at play, and those variables have to be addressed. It’s also important to consider the software used to drive your on set displays, including CMS and digital signage developers. Most of these companies don’t pretend to be experts in the actual signage itself but instead work with the big display manufacturers to explore proposed applications, locations of the units and the return on objectives to give customers all the options available to them. “A strategic display partner will explore all the factors with customers, and make sure that they get the right products for their applications and the return on investment aligned with business objectives. Doing so delivers happy customers, ones that will keep coming back to providers as needs dictate,” says Yanke. Conducting a technical evaluation of different products either directly or through a technical adviser with the proper experience and understanding of both the available products on the market and the application use should be done early enough in the process so the technical aspects are key factors in the decision making process. Sometimes the “technical” advisor is not technical at all, anyone can recommend on price, your technical advisor should not have the title of purchasing agent, or set designer. 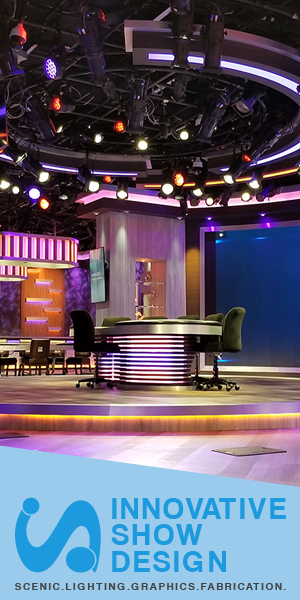 A good broadcast set designer will already have a relationship with a qualified set tech integrator to ensure AV tech uniformity throughout the process. Keep in mind not all AV tech integrators understand broadcast and typically are digital signage integrators working the retail market. 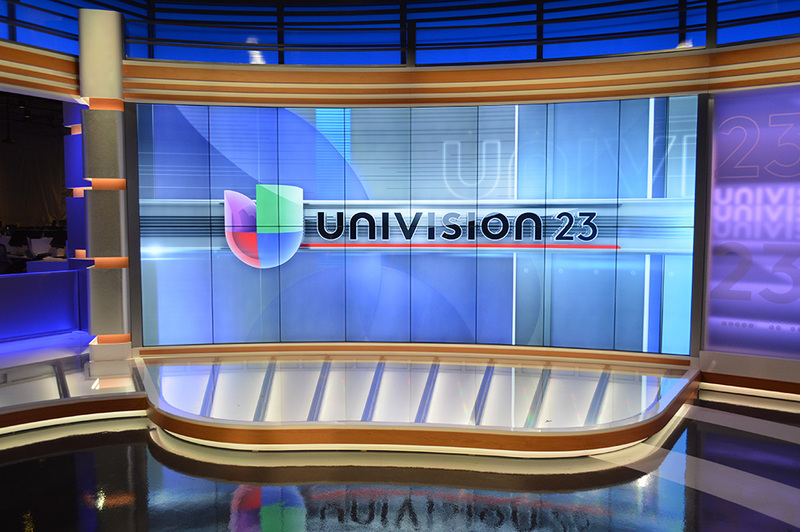 Look specifically for a broadcast set AV tech integration firm that understands broadcast engineering completely to assist you in the process. “Commercial displays provide a wider range of settings than consumer displays and in the hands of an integrator experienced with broadcast sets, allows the panel to be perfectly matched to the cameras,” Young added. Beware of a set design company that leads with a consumer display as a cost savings measure as these displays are not designed to the same standards as professional commercial grade displays. Important factors such as inter-panel illumination uniformity, color gain and offset controls are not considered in the design or even tested during manufacturing. These display operational performance characteristics go directly into the final picture quality which can be achieved by choosing the right displays. Operational specification tolerances during manufacturing are tighter and highly repeatable during production runs with the professional displays, where quality has a leading importance over quantity.